At the Workbays Village exhibit at ECAL University in Switzerland, students explored the possibility of turning cubicles into spaces for life. The resulting ‘pods’ imagine a different kind of living. Just like a village with the house as its smallest independent unit, this one presents an office with cubicles redesigned for specific purposes. The pods maximize the otherwise small space by making areas for everything. 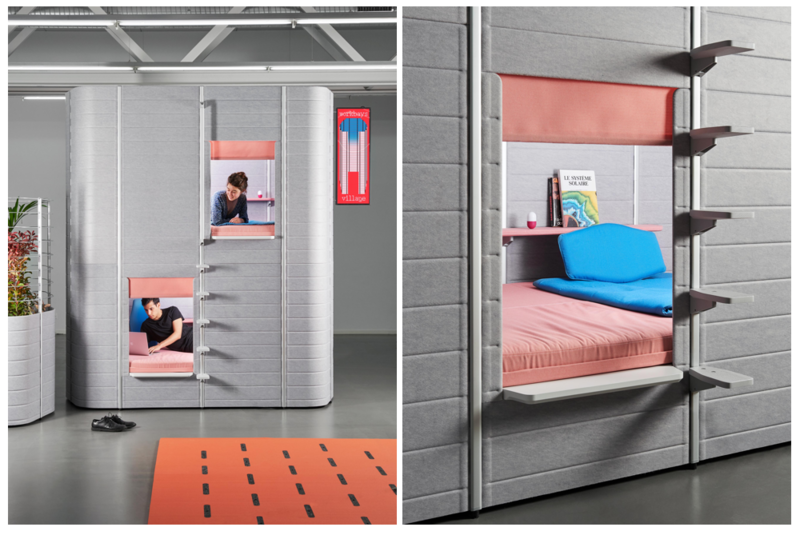 For example, some cubicles were converted into two-story sleeping capsules—perfect for an office nap. To make things even more comfortable, each single pod has purpose-built furnishings. A magnetic lamp by Yen-Hao Chu lets the user mount a light source on the walls of the sleeping cabins. Another cubicle was repurposed into a bar area. The bartender stands inside while the perimeter is lined with the bar top. It’s a clever design that espouses the point of the project: transforming the monotonous and drab quality of a 60s office cubicle to make it more fun. Camille Blin, the designer and professor heading the display, says it was a student-initiated project. “The ECAL students suggested we devised new typologies for these working environments, adding novel features and supplying them with new accessories,” she explained. Aside from the sleeping pods and the bar, staples of any modern office are also present. 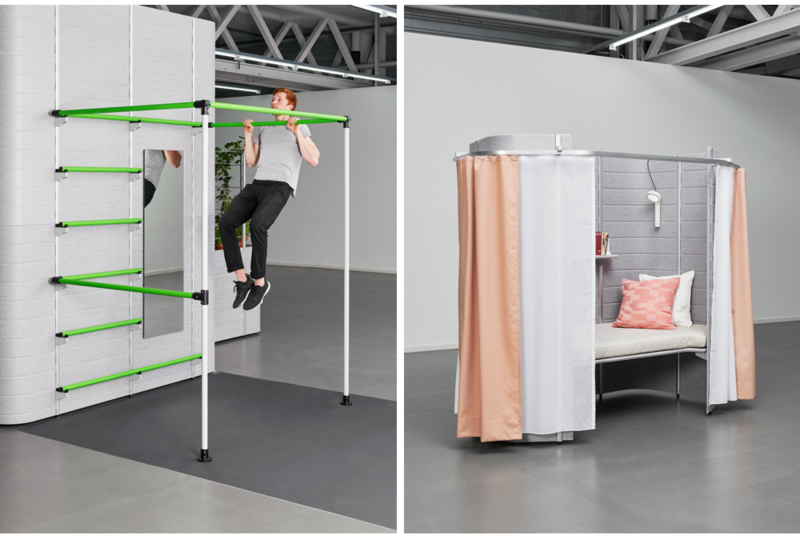 For a fitness area, the cubicles support exercise bars. The stadium bay, which can seat four people over a narrow table space, will be an interesting meeting room. The hacking bay uses the structure as storage for tools to create things. A unique furnishing, Plug and Tray, has plenty of stacked electrical sockets for a crew to charge and leave their devices. Another interesting use of the cubicle structure is a mini garden containing shelves to hold potted plants and storage for all of the necessary tools to maintain them.